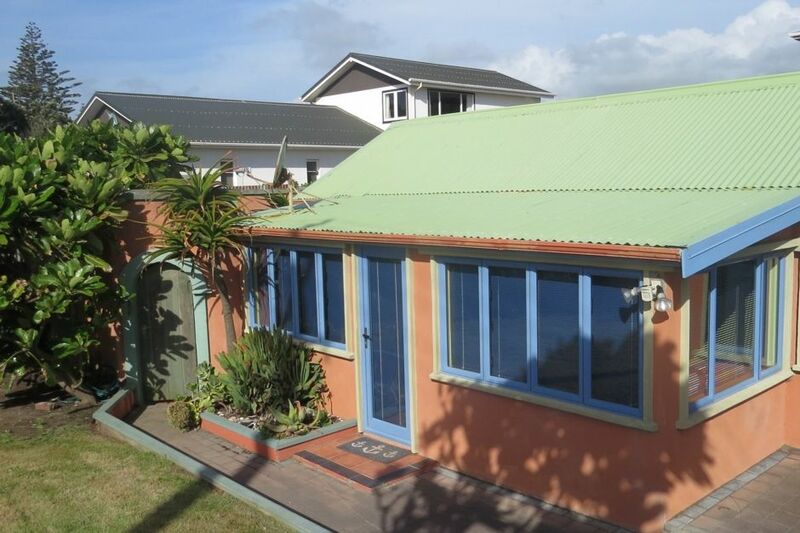 This tastefully revitalised 1920's villa is located opposite Otaki's beautiful beach. It has trendy decor throughout with modern furnishings, and all the comforts of home. The house comfortably sleeps five. The bathroom is up to date with easy outside access - and includes a washing machine! There's a TV with Freeview, great DVDs, and lots of books for relaxing inside on cooler or rainy days! We have a good selection of board games and puzzles. Cook indoors utilising the fully fitted kitchen - or choose alfresco dining in the outdoor area with gas BBQ and courtyard seating. We even have a picnic table for the kiddies. The courtyard is the perfect private, sheltered spot. The lovely water feature is mesmerising, sparkling at night. You will see our maiden, or "kohine" in Maori - for whom the house is named. Just cross the road and you're at the beach! Otaki beach is the best beach along the Kapiti coast, with uninterrupted, flat coastline and safe swimming. We have chairs, beach towels and toys. As you look out at Kapiti island, all your worries and cares will disappear! Sunrise and sunset are breathtaking. An hour from Wellington or Palmerston North and you're in a world filled with natural beauty - the beach, rivers, estuary, Otaki Gorge and Tararua ranges. Horse riding, tramping, picnicking, trout fishing, kayaking, cycling and golfing, as well as swimmin pool and gym, are all within easy distance. Museums, a library, and local events add a cultural dimension to your stay. We have up to date information and maps onsite for you. Otaki has over 35 outlet stores, a Sunday market, supermarkets, a butcher and bakery. Lots of takeaways - fish and chips, Chinese, Indian, and sushi! Head to the dairy for an ice cream on your way to the playground. Located 75km from Wellington airport, 20km from Paraparumu airport, 15km to the Waikanae station and bus services nearby. Come visit Kohine -- guaranteed a fabulous holiday any time of year! Nightly rate is for two people, extra children are $10 per night, extra adults are $20 per night. Check in 2pm, check out 11.00am. Minimum of 2 nights for all weekends, 3 nights for long (stats) weekends, 4/5 nights for Easter and High Season. Smoking strictly outside only. No discounts in high season unless 14+ nights. Wife, mother, grandmother and associate professor all in one! We love the ocean views, cosy courtyard and colourful surroundings of Kohine! The perfect warm spot for a holiday with plenty of local activities year round! Cute character filled beach house. We throughly enjoyed our stay at Kohine. A delightful little beach house in a great position opposite the beach. Lots of great outdoor toys for the younger person in our group & lovely private areas where we could sit outside and enjoy the sunshine. Comfty beds & a lovely homely feeling as soon as you walked in the door. We will be back. Thank you for sharing your lovely place. Easy access which was important. Cottage is very cool. Loved it is all I can say! Right across is the Otaki Beach! Nothing negative to say. Just perfect!!!! Instantly had a nice homely feel the moment we opened the front door. Great location, just hop skip and jump to the beach front for a cool dip or lovely sunset. I love my cooking and was super impressed the kitchen and all the kitchenware available. House had a cosy layout but utilised the space really well offering lounging and dinning areas including a nice and private outdoor patio. Would highly recommend this clean and relaxing beach living experience to anyone. Thanks again for the stay.